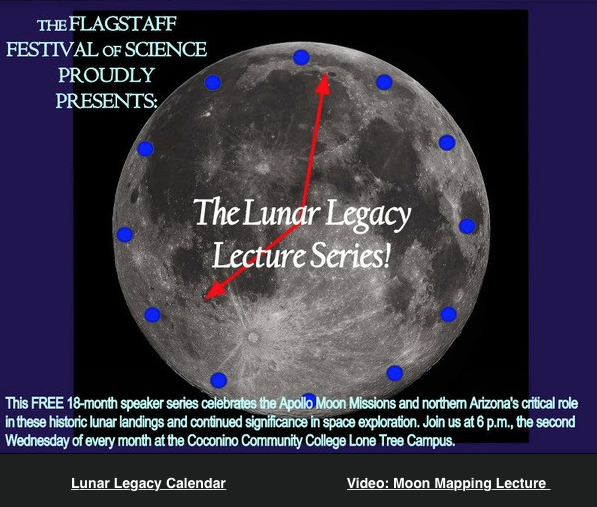 The Flagstaff Festival of Science will present the Lunar Legacy Lecture Series program —Telling Time by the Moon, at 6 p.m. Wednesday, April 10 at Coconino Community College, Lone Tree Campus. The Moon is our closest astronomical companion. Its orbit around the Earth gave us a basic unit of time: the month. Over the course of a month, the moon gradually changes from complete darkness to complete illumination. These phases give rise to a simple method for estimating the local time of day. Once we understand why the phases occur, and we notice where the moon is in relation to the horizon, we can estimate the time with coarse accuracy. We are looking for scientists, engineers or other sciencey folks to share their work and passion with the Northern Arizona Community. Go to the Festival website (scifest.org) or follow this link to go to our sign-up for lecturers, in school speakers, hosting or leading an activity, and Science in the Park booth. This is the first year that all sign-ups are done online. Please contact Brandon at lurieba@gmail.com if you have any difficulty or questions. All applications are due by April 30th. The 2018 SCI Talks are now online! Visit our YouTube page to watch videos from the past four years of SCI Talks. This past year featured Rob Kellar presenting on regenerative medicine, TJ Janecek sharing his story of building a technology company in Flagstaff, Billy Cordasco exploring the intersection of art and scientific study at Babbitt Ranches and Emma Wharton recounting the building of grit in teenagers on the Colorado River with Grand Canyon Youth. All talks are approximately 20 minutes or less and given by local Flagstaff scientists, engineers, educators and artists. Do you have a personal story to share about the lunar missions and Northern Arizona? We would love to add your voice to our oral history of Flagstaff’s unique relationship with the early space pioneers. The Lunar Legacy Lecture Series! This FREE 18-month speaker series celebrates the Apollo Moon Missions and Flagstaff’s Critical role in these historic lunar landings. Parking is FREE for this series. All Flagstaff Festival of Science activities are free thanks to the hosting organizations, presenters and our generous supporters! The Flagstaff Festival of Science is made possible through the generous support of businesses, organizations, foundations and individuals. Major sponsors include W. L. Gore & Associates, City of Flagstaff/BBB Revenues, Flagstaff Arts Council, Northern Arizona University, Blue Cross Blue Shield of Arizona, Arizona Community Foundation of Flagstaff, Science Sandbox, Wells Fargo and Peaks Audio Productions.